A Mile-By-Mile Guide to the Best Stops and More! 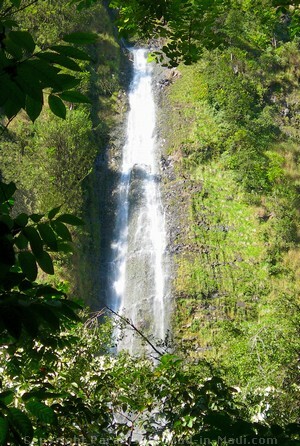 Haven't read part 1 of my guide to the road to Hana, Maui, yet? Click here for PART ONE of my mile-by-mile guide to the Hana Highway. On our drives down the winding road to Hana, we've seen awe-inspiring beaches, hiked and swam to hidden waterfalls, explored lava tubes, gorged ourselves on local banana bread from charming roadside stands, and so much more! If any of that sounds like fun to you, then don't miss out on the rest of my guide to the Road to Hana, Maui! 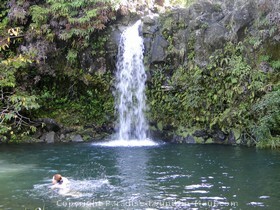 There is a pretty waterfall here at Pua'a Ka'a Wayside Park that is less than a 5 minute walk from the parking area. I liked the fun of picking my way carefully across the rocky stream (pictured above left) to get a good look at the falls, where I found several people enjoying a swim. 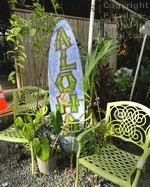 You'll find this spot about halfway between Hana Highway mile markers 22 and 23. To get to these falls, just head across the road from the parking area - you'll see a picnic area to your left and stairs to your right. Take the stairs to a little path that will lead you to that rocky stream crossing I mentioned. If you go, be aware of the possibility of flash floods as your cross the stream (and if you go swimming), as well the potential for falling rocks. Parking for this stop is on the ocean side of the Hana Highway, in front of the restrooms. Top Pick! 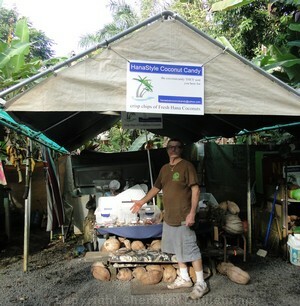 You can't miss Nahiku Marketplace, just before mile marker 29 on the road to Hana, Maui. This is a great spot to park, stretch your legs, shop and grab a bite to eat! There's a great souvenir shop here, and also a wide selection of food varying from island style tacos to kalua pork to classic hotdogs or mac 'n cheese! If you want delicious coconut candy that's actually more coconut than sugar, look for this guy! 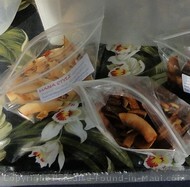 His "HanaStyle Coconut Candy" was different from most because it wasn't coated in a thick layer of sugar. He patiently slices the coconut super thin, then slow roasts them with a little bit of sugar to bring out the flavour. He offers light and dark roasts, as well as flavoured varieties. It's absolutely delicious! 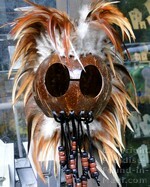 This Guy Makes My Favourite Coconut Candy! Top Pick! 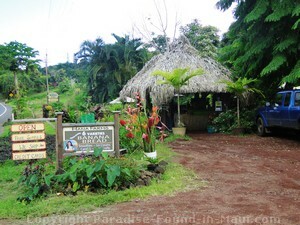 This spot is super fun, and another one of my top picks along the road to Hana, Maui! 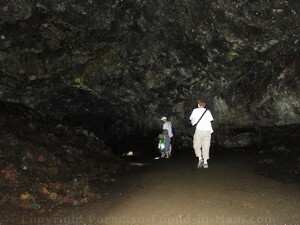 All ages will enjoy exploring the unique underground environment inside the Hana Lava Tube. There are easy self-guided tours available that take about 40 minutes to complete. If you're really enjoying yourself, feel free to take your time and stay longer! On a hot day, the cooler caves provide a welcome respite from the heat. To get here, look for the turn-off onto Ula'ina Road, a little bit past Hana Highway mile marker 31. You'll be making a left turn. Once you're on Ula'ina Road, just keep your eyes open for the Hana Lava Tube visitor center and signage. Top Pick! 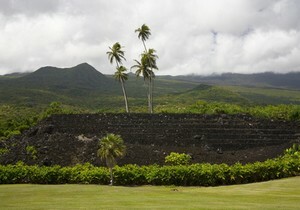 In Kahanu Gardens, you'll find what is thought to be the largest temple in all of Polynesia: Pi'ilanihale Heiau. The self guided tours through these beautiful gardens should take about 1.5 hours or more and are available six days a week (Mon-Sat) during the day, with no reservations required at the time of this writing. For full details, you can check out their website. To get here, just keep on driving past the Hana Lava Tube on Ula'ina Road. You'll find them on the right side of the Hana Highway in between your stops at the lava tube and Waianapanapa State Park. Another stop in the same general area is the Hana Airport. Most visitors passing by on the Road to Hana, Maui, won't find much of interest here. 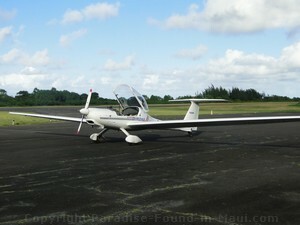 But if you've signed up ahead of time for a glider ride in the Hana area, there are good odds you'll be taking off from here. 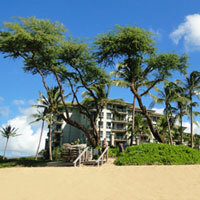 You'll see a large green sign on the inland side of the highway reading "Hana Airport." Just ahead, you'll see Alalele Road, where you'll make a left turn. Top Pick! Waianapanapa State Park is another one of my absolutely favourite stops along the Hana Highway because there is a ton of stuff to see here. You get to check out Waianapanapa's beautiful black sand Pailoa Beach, caves, hiking trails, ancient Hawaiian historical sites, a blowhole (which will be going off if you're lucky!) and more. Just past mile marker 32 on the road to Hana, Maui, you'll see Honokalani Road on your left - take this road to get to Waianapanapa State Park. Top Pick! These 2 stops are lumped in together because they share the same parking lot just past Hana Highway mile marker 42, and are right across the highway from each other. The Pipiwai Trail is a 4.5 mile hike that will take you to some incredible sights: a huge bamboo forest, past jungle streams, plus several waterfalls, ending with the jaw-dropping 400 foot Waimoku Falls (pictured right). Oheo Gulch is a popular stop for sightseeing and sometimes swimming (not in the ocean though because sharks like this spot!) There is a short 1/2 mile loop trail that takes you past the waterfalls and pools in this area. There are public restrooms in the parking lot area. 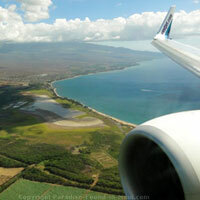 You'll have to pay the entrance fee for Haleakala National Park to access these areas. 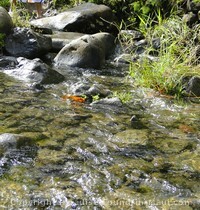 Our trek with Hike Maui on the Pipiwai Trail - you'll be amazed when you hear about our hiking companion! Can You Fit in All Those Stops on One Trip? Unfortunately, you won't be able to fit in ALL of these stops on your first trip along the road to Hana, Maui. But even if you only manage to get to a few of them, your day of driving the Hana Highway will be full of fun! I recommend you just pick and choose the ones that appeal to you the most and start from there. And as always, I highly recommend you stay one night in Hana so you'll have more time to check out all the fun stops along your drive. 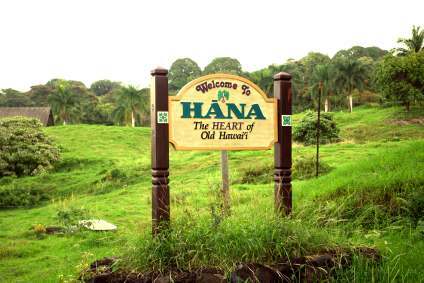 Don't Forget About Hana Town! You know how they say "It's about the journey, not the destination?" Well, don't let that give you the wrong idea. Your destination, Hana, has a few gems of it's own that you won't want to miss. 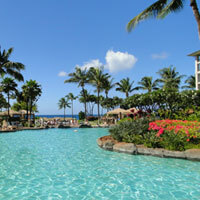 Find out more about the town of Hana Maui: things to do, where to eat, where to stay and more!